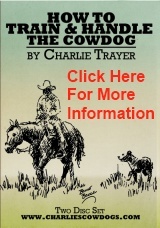 Click the links below to read so great tips from Charlie about training your cowdog. Be sure to check back often for new cowdog training tips from Charlie. The first months of growing up to be a Hangin' Tree Cowdog.